The Great Firewall of China has been the bane of Chinese internet users for years, preventing people from accessing certain pages and applications in the name of national security or cultural appropriateness. After clashing with the Chinese government multiple times, Google services are going dark on the mainland, preventing users from accessing Google website and applications. According to people in China, the process of turning off Google services has been happening slowly over the last two weeks, with intermittent outages and slow response times. In March of 2010, Google said they would stop abiding by the rules of the Chinese government in regards to filtering customers search results. The IT Ministry of the Chinese government called Google’s actions at the time, “unfriendly and irresponsible.” For years Google would struggle with striking a balance between the needs of their customers and the harsh restrictions set in place by the government. Google has always said that they would be willing to deal with the consequences of their actions, and rarely have they simply conceded to the rules set forth by The Great Firewall. Now it looks like the Chinese government has put a stop to Google’s unwillingness to conform by simply blocking access to Google Search, Gmail, and virtually all other services. Google confirmed that everything appears to be operating normally from their side, leading many to speculate that the lack of access is a direct response by the Chinese government. The timing of the block is interesting, as the Communist Party Congress is in session, as part of its once-a-decade meeting that precipitates transition within the government. The party had expressed interest in cutting off means of communication for dissident individuals, and it may be that disrupting Google service is a part of that plan. Chinese citizens are also reporting issues with other Western based services such as Yahoo and AOL. There has been no official announcement by the government. Some users are reporting that they can still access Google Canada, Google Taiwan, and services based in other countries. This temporary workaround may suffice until after the party changes are completed, or we may see an additional crackdown on users across the country. Do you live in China? 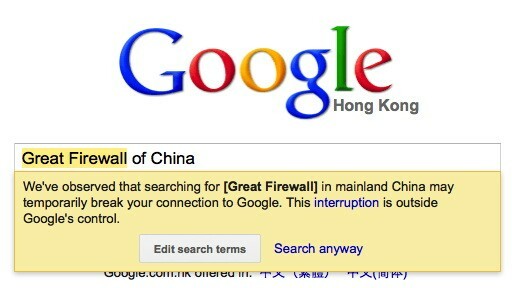 Let us know about your experience with Google over the last two weeks and with The Great Firewall since the beginning of the party congress.